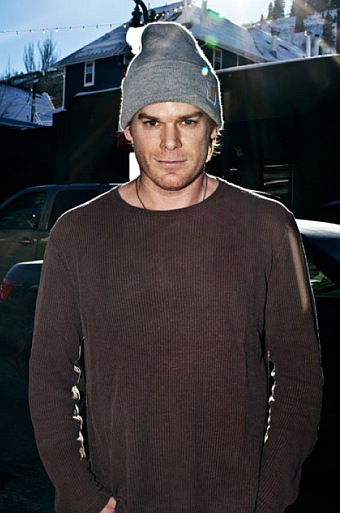 Dexter Daily: Michael C. Hall: "I Can’t Deny That I'm Drawn to Creepy Characters"
Michael C. Hall: "I Can’t Deny That I'm Drawn to Creepy Characters"
Via: The Wall Street Journal: In the coming film, “Kill Your Darlings,” Michael C. Hall, star of the Showtime series “Dexter,” plays David Kammerer, the real-life English teacher who followed Lucien Carr to New York during the nascent stage of the Beat Generation. Kammerer’s obsession with Carr, and his own untimely death, is a relatively little-known fact of the Beat Generation of poets, which included Carr (played in the film by Dane DeHaan), William Burroughs (Ben Foster), Jack Kerouac (Jack Huston) and a young and green Allen Ginsberg (Daniel Radcliffe). Hall’s portrayal of Kammerer manages to make you both squirm in your seat with discomfort, and empathize with the pain of unrequited love. Hall said he’s always been fascinated by the Beat Generation of poets, and went through a “Beat phase” of his own in his 20s. “I was lucky enough to meet [Allen] Ginsberg in the early ‘90s,” he said, explaining that his old college friend worked for Ginsberg. The friend helped bring Ginsberg to their college in Indiana for a poetry reading. Later, through the same friend, Hall was able to visit Ginsberg at his apartment in New York and to host the poet at his own apartment a couple times. During their first encounter, Hall said Ginsberg asked him what he did. He replied that he was an actor.